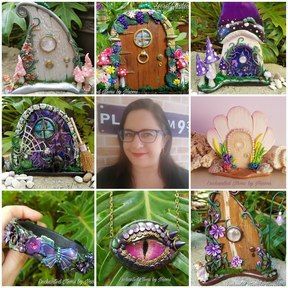 A one of a kind piece with hand sculpted little features like a little bat sitting above the tiny door... with purple, pink and black pattern on the door and vine with pink flowers... placed on a silver tone charm backing. Comes in a little gift box with matching silver tone necklace. Approx. 5cm long x 2.5cm wide.